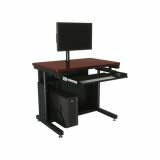 Each computer table adjusts from 24"-36"H and includes CPU holder, monitor mount and keyboard tray. Specify frame and surface color when ordering. 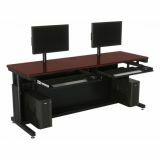 Adjustable Height Computer Table Set - Double, 72" x 30"